Fish glue is, together with skin and bone glue, one of the oldest types of glue in the world. Fish glue was already used since Prehistory. Fish glue was used for i.a. glue paint, fletching arrows or fastening arrows and arrow heads. Glue paint was already used in Prehistory. 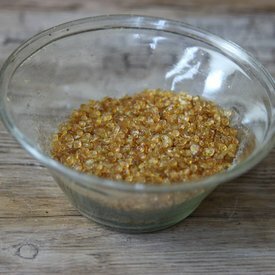 To make it, you can soak and resolve the animal glue in warm water au bain marie. Consquently you rub the glue with pigments. This paint is not water resistant. Test the material on a small surface before use. Celtic WebMerchant is not liable for the obtained color result. This item is handmade at the Zaanse Schans in a traditional Dutch windmill from 1782. This is the only remaining still working paint windmill in the world. Pigments have been grinded in Dutch windmills for centuries. This item can't be shipped outside Europe.